The Nagle Centre was founded in 2003 to provide computer training to the parents of girls attending the Presentation Schools – both Primary and Secondary in Waterford city. Its inception was aimed at addressing a lack of computer training facilities in the local area and its purpose was to encourage active participation in their children’s education and to bridge any gap in their own. The remit has expanded greatly since then but the ethos remains the same – to offer affordable computer training to the local and wider community with an emphasis on supporting marginalised communities. The centre has actively engaged with new communities to promote education through computer training, source funding and liaised with partners such as the Integration & Support Unit – ISU. There is a deep understanding held within the centre’s staff of the barriers that people face in Education and we have taken progressive steps in reducing these barriers. For instance, courses are constructed to work with the learner and at their own pace. Classes take place in a welcoming and open environment and all students participate in an assessment process which establishes training needs and learning styles to optimise the learning experience for the student. Any learner who does not have access to a computer can borrow a laptop from the centre to practice and develop their computer skills. Furthermore, the centre offers a number of free mentoring sessions every week which provides a space for learners to come and practice and have expert advice on hand if needed. The centre also runs a number of Awards Nights throughout each year which showcases our learners’ achievements to their families, friends and the wider community. Integration has always been a key principle with in the centre and to date we have not run gender or ethnic specific classes. The centre offers customised training programmes which focuses on the specific requirements of learners whether on a one-to-one or small group setting. These customised training programmes can be accredited or non-accredited depending on specific requirements. The centre is a registered QQI provider and offers programmes at levels 3, 4 and 5. We are also an ECDL, Microsoft Office Specialist (MOS) and SAGE certified training centre. Seven years ago the buildings of the South Presentation Convent were in a perilous position. As the area around the convent changed, the need for the school complex the site housed declined and the school closed its doors in 2006. Most of the buildings, some over 200 years old, sat empty with just a few resident sisters to maintain them. The Presentation Sisters had to plan for the future. With so many listed buildings housed upon it, the site was of little development value. What was to be done? The Presentation Sisters decided to act, just as their foundress had done nearly two hundred and fifty years before. They set up a company, appointed a voluntary board, and put in place plans to redevelop ‘South Pres’ as a special place for the people of Cork City. The heritage buildings have been lovingly regenerated, they now house educational charities and rooms are also available to let by community groups, charities and local businesses. The chapel has been turned into a heritage centre that engagingly tells the story of Nano Nagle and the city in which she worked to educate and care for the poor. It allows the visitor to explore the incredible spread of the Presentation Order, the changing lives of the sisters who have dedicated their lives to that order and the remarkable work they still carry out as educationalists and campaigners for social justice. Come and visit Nano Nagle Place, get involved and become part of our story. In September 1994 a member from each of the three Religious congregations – Presentation Brothers, Presentation Sisters and Christian Brothers opened the door to a group of young people, boys and girls aged fifteen and sixteen, in The Hut Gurranabraher, Cork. It was the beginning of a joint project on behalf of young people at risk in the area, and was named ‘Presentation Family Community Project’. Since that small start many things have changed- the location, name, clientele, project team, work programme, management structure and funding. What has remained constant is the underlying caring philosophy, supported by the trustees of the Three congregations. The three team members formed Community for each other through at first living in their congregational houses. In 1996 a house was purchased at 109 Knock free Ave and it was shared as a home for both project and community. Presentation Sisters and Brothers and Christian Brothers are no longer involved in the day to day running of the project which is now entirely staffed by lay people. Core funding is provided by the Probation Service. Other costs are met principally by the Young Peoples Facilities Fund, also by Cork City Council, City of Cork VEC, Health Service Executive, and also by the Trustees. We are also supported in practical ways by business in the community. North Side Community Enterprises pay the project members through the Community Employment Scheme. A Board of Management has been in place since 1999 to guide and support the working of the project. They in turn link in with our trustees through the Chairperson. 1996 – Purchase of 109 Knockfree Ave.
October 2004 – Purchase of 107 Knockfree Ave.
2004 – Renovation of 107 and 109 Knockfree Ave.
2004 – Building of Work Shop. 2007 – Official Opening of Extended premises by Right Honourable Lord Mayor of Cork Donal Counihan. 2008 – Development of extensive Garden Project. 2008 – Building of Glass house Garden Area. 2008 – Opening of Garden Café Training Restaurant under licence from Cork City Council. 2012 – Continous development of Garden Cafe Project. to educate towards a deep, active and enlightened awareness of this amazing universe of which humanity forms an integral part. The holistic philosophy which informs the Tara Centre’s vision encourages intellectual enquiry and shapes a wide range of healing and life-enhancing initiatives. These are experienced in the caring environment of a healing community and a warm welcoming building where the entire ethos breathes respect. At the Tara Centre, people often find a new direction for their lives. They come in touch with deep inner resources, and are reminded that there are others who share their values about life and its meaning, and find inspiration in a communal quest. Mount Saint Anne’s is a Retreat and Conference Centre founded by the Presentation Sisters in Ireland. As Presentation Sisters, we are committed to a spirituality of being in communion that seeks God in the interconnectedness of all life and nurtures a longing to create a more compassionate, just and sustainable world. Nano Nagle, our Foundress, led a deeply spiritual life. Her faith sustained her in her life of service. Here at Mount Saint Anne’s we offer a range of opportunities for individuals and groups to take time out for reflection and to deepen their understanding of the movement of the Spirit in their lives; time to explore how they too can live life in all its fullness. Faith has been described as ‘a love of truth, a personal dedication to truth, and a practical living out of life according to the truth’. We strive to create the conditions where individuals and groups can be quiet and open their hearts to the silent presence of the spirit. A Catholic bank in Ireland set up by nuns claims it is weathering the recession because of its ethical approach to business. As banks and credit unions across the country continue to suffer dramatic downturns in the face of economic turmoil, the Dublin-based Clann Credo says it has encountered no problems over the past few months. It says it invests only in ethically credible companies and lent seven million euros (£6.2m) to charities last year. 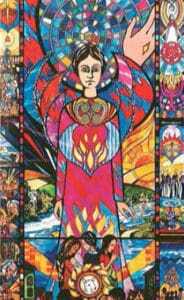 Set up by the Presentation Sisters in 1996, it has funded more than 2OO community and voluntary projects in Ireland. Its revenue is derived from contributions from more than 2O Religious congregations and from the Government’s 25-million euro (£22.3m) seed-capital fund for social projects. Clann Credo’s stability is now being hailed as a model for ethical investment by the Ecumenical Council for Corporate Responsibility (ECCR), a coalition of British and Irish Churches and other groups. “One thing this crisis has shown is the volatility of the non-ethical mainstream,” said ECCR coordinator Myles Litvinof. Meanwhile, Ireland’s most senior Catholic churchmen have expressed concern that irresponsible and destructive behaviour in the corporate world have damaged the fabric of society and brought the world economy to a dangerous and uncertain state. Speaking at the Pro Cathedral in Dublin on Sunday, Archbishop Diarmuid Martin said that individual bad behaviour led to a negative trend which was socially destructive. “When individuals lose a sense of integrity in their own lives, their destructive behaviour begins to negatively influence society with consequences especially for the weakest. This is what we see in the economic crisis,” said the archbishop. iScoil is an inclusive on-line learning community offering a pathway to education and employment for young people aged 13-16 years who are out of mainstream education. iScoil was developed by Presentation Ireland and funded by the Presentation Sisters to meet the needs of these young people by using digital technology to re-engage them in learning. iScoil is now a registered charity and limited company. Support progression to further education and employment. The majority of iScoil’s referrals are made by TUSLA Education Welfare Officers for early school leavers aged between 13-16 years. Each referral is reviewed carefully to ensure that iScoil is in the best interests of the young person referred. When accepted each student receives an iScoil pack that provides all information required to log in to their system. Once online students start with some basic learning activities and exercises designed to allow iScoil tutors assess learning styles and interests. Students are assigned an individual online mentor and introduced to online subject tutors who are always available to contact and provide help and support. iScoil tutors will build a personalised learning plan on their system that is designed to bring out the best of the student’s abilities and be reflective of their interests. Each day the student completes work from this learning plan and online tutors and mentors review the work, provide feedback and adapt the next day’s learning plan as required. Challenge to Change is a development education project aimed at young people attending Presentation Primary and Post-Primary schools. The Vision of the project is driven by the Presentation charism and ethos which embraces the challenge of working with those who are marginalised and excluded, for whatever reason. Justice, human rights, sustainability and promoting right relationships are central to the Presentation mission. Collaboration with the Presentation network, through linkages with Presentation schools abroad, is encouraged. By informing the students and the wider community the project will bring about a heightened awareness, a social consciousness, a broader vision and an appreciation of development issues.